The Mönch 4107 is a cathodoluminescence detector for STEM that has been built from the ground up to realize unparalleled signal-to-noise ratio and spectral resolution. 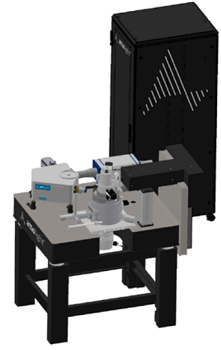 It is used by demanding researchers who are keen on measuring simultaneously ultra-high-resolution images and hyperspectral maps of individual quantum dots, nanoparticles, or atomic defects. The design behind the Mönch 4107 has a solid publication track record, which includes reports on nano-plasmonics, simultaneous measurements of cathodoluminescence and EELS, non-linear spectroscopy of individual quantum wells, quantum nano-optics and more. When obtaining a cathodoluminescence map in a STEM, it is crucial that one reaches the preferred signal-to-noise ratio in the least amount of time possible, so that images can be generated with a large number of pixels. Yet, one can only accomplish ultrahigh resolution with weak probe currents, resulting in weak cathodoluminescence emission. 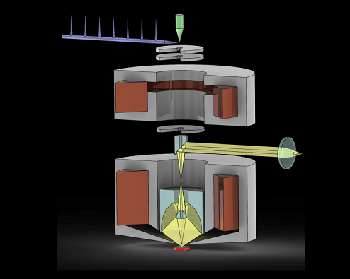 Consequently, the ideal cathodoluminescence detector is bound to accomplish the impossible: it should gather photons over an extensive solid angle and fit in the small gap between a sample and the pole pieces of the STEM; it should also preserve spectral resolution, brightness, and collection efficiency across large scanning areas. The Attolight Mönch 4107 realizes all this. First, its collection optics is crafted by Attolight engineers with maximum care to attain unparalleled curvature radius and miniaturization level; it is so thin that it can be housed in most aberration corrected or analytical STEMs available in the market, while maintaining sufficient degrees of freedom and stiffness to allow for flawless sub-micrometer alignment of the mirror while installed in the STEM. Then, the Mönch 4107 gathers and couples cathodoluminescence directly into a fiber bundle and carefully preserves the intensity of the signal throughout a spectrometer, so that constant spectral resolution is realized. Lastly, an ultrafast EMCCD camera measures the signal and produces huge hyperspectral maps in seconds. Data can be directly attained and visualized in user’s favorite acquisition software in parallel with other methods (EELS, EDS, etc.). The Mönch 4107 is not only another add-on. It is a solution produced by a company that designs electron microscopes and has years of expertise in spectroscopy and optics. 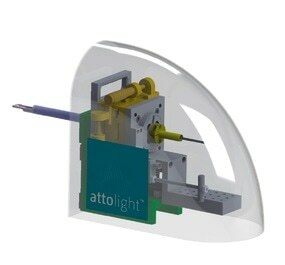 Attolight took all the know-how it assimilated designing and manufacturing dedicated cathodoluminescence scanning electron microscopes and used it to develop STEMs. 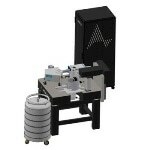 The Mönch 4107 includes a proprietary actuated collection mirror for rapid and perfect optical alignment, a scientific grade high speed camera for fast hyperspectral data acquisition, a fiber coupled spectrometer for high resolution spectral analysis, as well as a hyperspectral optimized scanning module for optimal control of the STEM beam. S. Meuret et al., ACS Photonics, 3, 1157–1163 (2016). R. Bourrellier et al. Nano Letters, 16, 4317–4321 (2016). Simultaneous cathodoluminescence and electron microscopy cytometry of cellular vesicles labeled with fluorescent nanodiamonds. S. Nagarajan, C. Pioche-Durieu, L. H. G. Tizei, C.-Y. Fang, J.-R. Bertrand, E. Le Cam, H.-C. Chang, F. Treussart, and M. Kociak Nanoscale, 8, 11588 (2016). N. Kawasaki et al. ACS Photonics, 3, 1654–1661 (2016).